20-4 run for the #Cavs . #Celtics look completely confused on offense and the #Cavs bench has a combined 18 points. 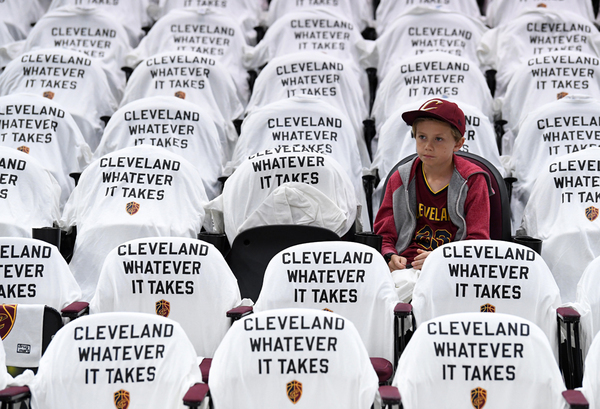 Cavs with just one first-half turnover and are 7-7 from the line. Cavs on a 20-3 run thanks in part to 4 quick turnovers for the Celtics. T/O Boston. Cavs have outscored the Cs 34-23 since Kevin Love left the game with a head injury. It's almost looked like Cavs are trying to give LeBron a possession off on offense here and there to rest. He's played the whole game so far. One thing I am sure of: There is more slapping in basketball than any other major sport. Marcus Smart is rolling in friendly-bounce 3-pointers so that might be it for this one. LeBron might have to go the full 48. #Celtics lead #Cavs 25-20 after 1Q. Brown 15 on 6-for-8 FG. Rozier 4; James 8, Hill 6, Love 0 (in locker room after head collision). J. Brown Q1: 9 mins, 15 points, shooting 6-for-8, 2-for-2 from three. Jaylen Brown with a 15-point first quarter and Kevin Love remains in the locker room after taking a blow to the head. Another outstanding first quarter for Jaylen Brown. Now 5 for 7, 13 points. 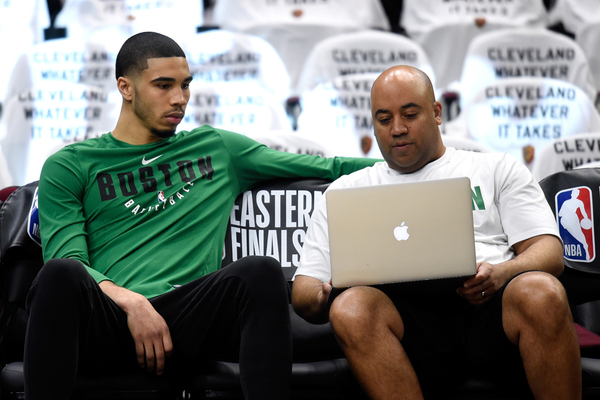 Tatum is staying in the game. A trainer spoke to love for like a minute, then went directly to a member of the coaching staff and Love went right to the locker room. Yeah it was a direct head-to-head collision. Didn't look good. Kevin Love and Jayson Tatum may have bumped heads, but Love looks really shaken up. Couldn't stand and signaled for help. 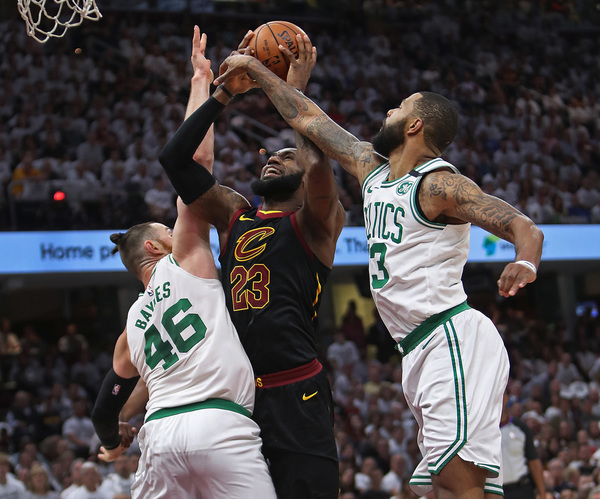 Celtics have already missed as many free throws (two) as they did in Game 5. 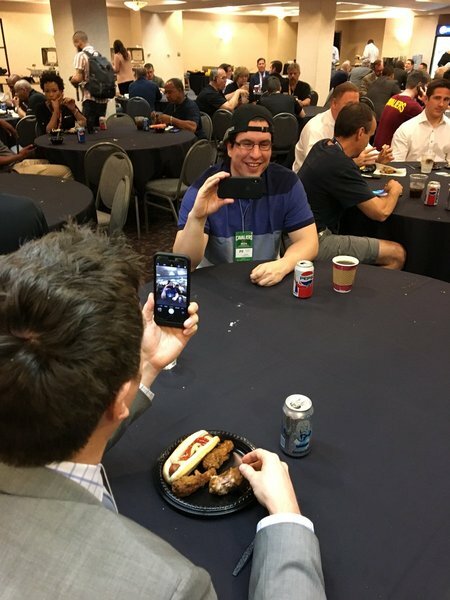 Talked with some Cavs fans ahead of Game 6 about facing elimination and – maybe – life after LeBron. Same #Celtics lineup for Game 6 with Baynes. #Cavaliers . No surprise but Cs are sticking with Baynes lineup.